Are located in the Ore Mountains in Hunedoara county at about 25 km from Orastie, 43km from Deva, 18km from the Railway station Geoagiu, 160 km from Cluj-Napoca. Along with other key sectors of the basin the Valley of the Geoagiu: the Keys Glod, Ardeului, Cibului and Baciei, Cheile Madei represents a point of tourist attraction especially for those in the spa and climatic Geoagiu spa. 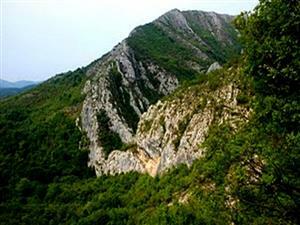 As additional point of attraction both in the Keys Madei and in Cibului Keys, the climbers have made routes of rock climbing sport and rock climbing. Camping place is found around the Cliff in a glade, or simply in the open air at the base of the surplombelor. The water power of attorney from the locals or from the inside of the keys to the fountain of mineral water from the right slope located a few hundreds metres from the entrance to the downstream of the collection. Keys Madei'm a natural reserve with a rich flora and fauna, of being remembered chimneyed viper, common in the area of the Wall of the Cave. Access route: Access is particularly easy, common with the Geoagiu Bai up at the base of the coils (still 2km up in the resort) from here to the right follow the paved road towards the Zlatna another 3-4km and then to the left on a road not modernized to Mada, 7km, until in the center of the village where you can see the walls. Crossing the bridge over the river on a road wagon that runs through a few households, in 10 minutes we reach the base of the Cliff and from here on the paths well-defined in another 5-10 minutes to the Cave Wall (the wall the highest visible on the right as we look to the keys).